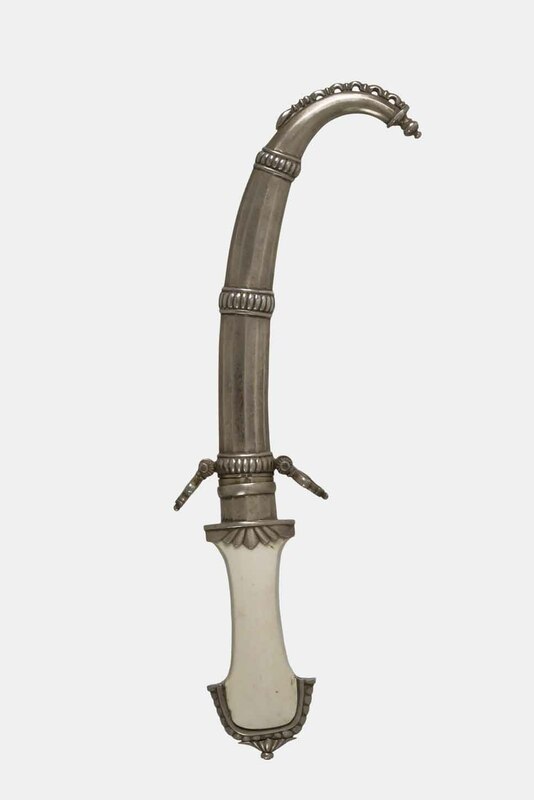 Dagger used by the Muslim peoples of North Africa, particularly in Morocco. Characterized by its slightly curved smooth steel blade, which is half edged, and four fifths counter edged. The Koummya is always worn visible over the tunic (dejellaba), on the left side, hanging vertically up to waist-length by a long wool string (baldric), tied to the rings of its sheath. This sheath is worn with its point turned towards the front. In this piece, the hilt is made of dromedary bone set in silver. The sheath, also in silver, displays both smooth and ribbed surfaces, divided by small frames filled with a scallop motif. Adaga usada pelos povos Muçulmanos do Norte de África, particularmente em Marrocos. Caracteriza-se pela forma ligeiramente curva da sua lâmina em aço, liso, com gume até cerca de metade desta e contra gume a quatro quintos. O Koummya é sempre colocado de maneira visível sobre a túnica, dejellaba, do lado esquerdo, suspenso verticalmente até à altura da cintura através de um comprido cordão em lã, baldric, atado ás argolas da respectiva bainha. Esta, por sua vez, deve apresentar a ponteira virada para a frente. Neste exemplar, o punho é construído em osso de dromedário com montagem em prata. A bainha, também em prata, apresenta superfícies lisas e caneladas divididas por pequenas molduras preenchidas com um motivo de godrões.